I love all the shading techniques that I see on cards ... especially the way some designers can use Copics. Its amazing. It gives such depth to a card. So you can imagine how excited I was when I discovered a new technique that shades simply using basic techniques combined together (you may already know about this, but to me it was quite a revelation!). I used the rock-n-roll technique with just one color and stamping off to create the shading. 2. 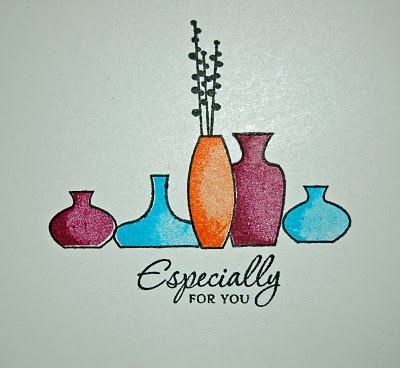 For the card I made I first drew a light pencil line on the card front to help me line up the vases I was stamping. 3. Next I stamped the outline vases. I did a little masking with a post-it note to make them look like they were behind each other. 5. Re-ink just the side of your stamp that you want to be shaded. To do this you tilt the stamp a little, just getting the edge on the ink pad and then rock your stamp on the ink pad to get the whole edge inked up. Thanks so much, Maureen, for this great tutorial. I'm looking forward to using this new technique. Y'all go check out her blog. GREAT tutorial for this shading/rock & roll technique! I'm sure to use, so glad I found your site (from Nikki Bond's link!). Great spin on the rock 'n' roll technique! What a great technique, and one that actually looks fairly easy to do once you understand the right approach. Thanks for sharing this Maureen! Thanks very for great tutorial and examples. Fab technique! I can't wait to give this one a try! Thanks so much! Looks like a really fun technique! I will certainly try this! Great tutorial. I enjoyed your tutorial and hopefully, I can use it in my artwork too. This looks fun! Thanks, I can't wait to give it a try!